I was listening to The Skirted Roundtable podcast ( http://skirtedroundtable.blogspot.com/) the other day and Joni, Megan, and Linda touched on a subject dear to my heart: when on a budget (we all are!) do we buy cheap or wait until we can buy better? As the designers pointed out, we as women often use shopping as entertainment; "retail therapy". In the process of recreational shopping, we are often tempted to fill our homes with a lot of Target, Hobby Lobby, Michael's, Stein Mart and the like. Nothing inherently wrong with these type stores, I shop there myself. But as Megan pointed out, spending many twenty dollar bills on cheap home decor can actually hinder us from buying something of better quality and design. It's a dilemna between instant versus delayed gratification. Filling spaces with just anything is like feeding junk food to your kids every night, it just never really satisfies. It is so much better to wait for the right piece to be found or budgeted for. Something perfect and meaningful. Something that really speaks to you. 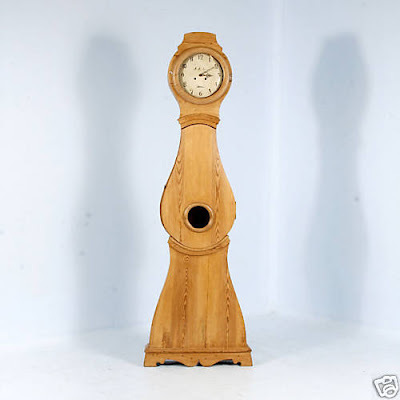 Here are a few things that are wonderful pieces; some are splurges and some are inexpensive with a lot of bang for the buck, (and hopefully you won't see them in all your neighbor's houses). This is sconce by Currey and Co. retails for $590 and is so beautiful. A splurge, but lighting can make or break a house. 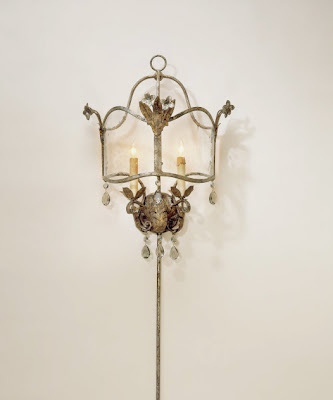 Here is the Garin Candle Sconce by Uttermost, retailing for $135. 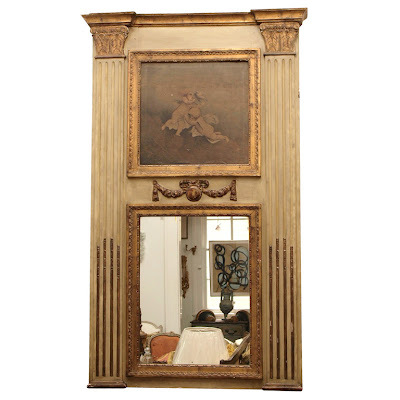 It is large with an antiqued finish and gives the look of way more expensive hard-wired sconces. 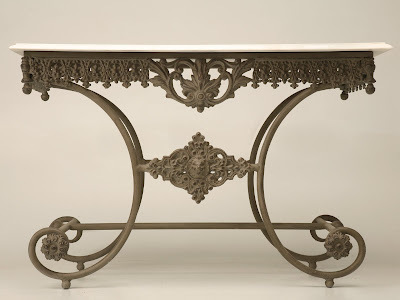 Gorgeous 19th c. French Trumeau from Bremermann Designs on 1st Dibs for $7200. Statement piece, obviously. 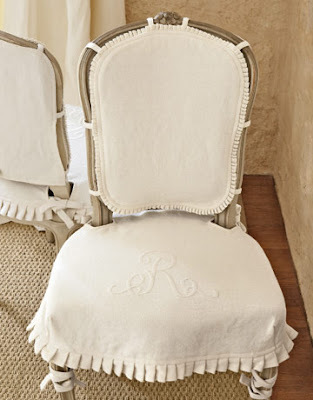 When a more expensive piece of furniture won't fit the budget, a pretty monogrammed slipcover can always update something you already own. There are so many wonderful things out there. It just takes a little searching, but the results are worth it! We are in Greenville, South Carolina and we thank you so much for commenting. As you can see we are mere "Babes in BLOGLAND" just getting our feet wet. We so agree with you and love your post today. Think we might be clones. Bet I say this to every client with budget concerns. I feel neglectful that I have not posted before just discovered you in the last week or so. Postively lovely content. Nursery is to die for. what a greata post!!! 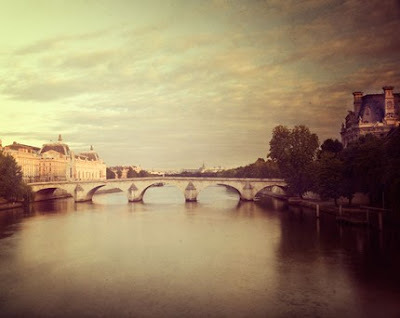 I really love that picture of Paris !!!!!!!! yes! thanks for the shout out. I think I'm going to create a new column on my blog for further Skirted Roundtable discussions like this. I had a designer friend say that every room needs a piece of bling, the more expensive piece that upgrades the look of everything else. Great post! Thanks Joni and Linda! I always feel like I want to chime in on the discussion as I listen, but my cats would think I was crazy! So I thought if anyone is interested I would add my two cents worth since I have been around the block a few times, not so much in blogging, but certainly in the biz. Thank you, Boxwood Terrace, for coming over! I so appreciate your lovely comment. It is good to know that when we write, someone is reading. Thanks Cameron for commenting. I'm glad this post was relevant for you. I appreciate you reading my blog and I hope you will come back. Comments like yours let me know what is important and timely. What a great post. A great piece will last, MAKE a room, and you will love it forever, I so agree with you! You can mix in less expensive things, but that ONE fabulous piece will pull everything else in a room up to a higher level.